At our house, this means hanging shelves. In order to actually put away new Christmas presents, one must first dig through the rack and shelf stash in the basement, determine which ones might work and then recruit the husband to get out his power tools and hang the shelves! So that is how we spent Saturday afternoon. Due to lack of any other wall space in the kitchen, we decided to hang shelves in the one remaining spot...the window! Actually, we think it looks pretty cute and it got 4 new additions off the table in the front parlor and two off the floor of the guest room! YAY! Then we tackled the big shelf for the Santa Claus Land collection. It was a bear but Tim kept at it and that got a lot of little stuff off the table! You can almost see the whole table now! During the week I tackled the big display in the den and revamped it. I like the end result. I now have an entire shelf devoted to vintage valentines and valentine themed collectibles and I merged the Thanksgiving and Rudolph together on another shelf. The rest of the little Christmas stuff including Santa Claus Land memorabilia got sent to the front parlor. I did leave two little soldiers in with Rudolph just because they looked cute together. I changed things around on the top of the big case a bit too, using risers and a new rack and just basically squishing things together a little more! Ha! It's growing on me. So, it's been a very productive few days around here. Which is a good thing as we have out of town company coming next week! Once again absolutely flabbergasted at the collection you have. 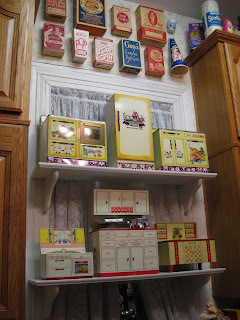 Love the shelf in front of the window with the little kitchen sets - amazing how creative you can get when you have fun things to display!